Raise Your Fork for a Great Cause! Everyone knows delicious food tastes even better when you’re eating it for a good cause! Miles Table is partnering with Greenfield Elementary School throughout the month of October. 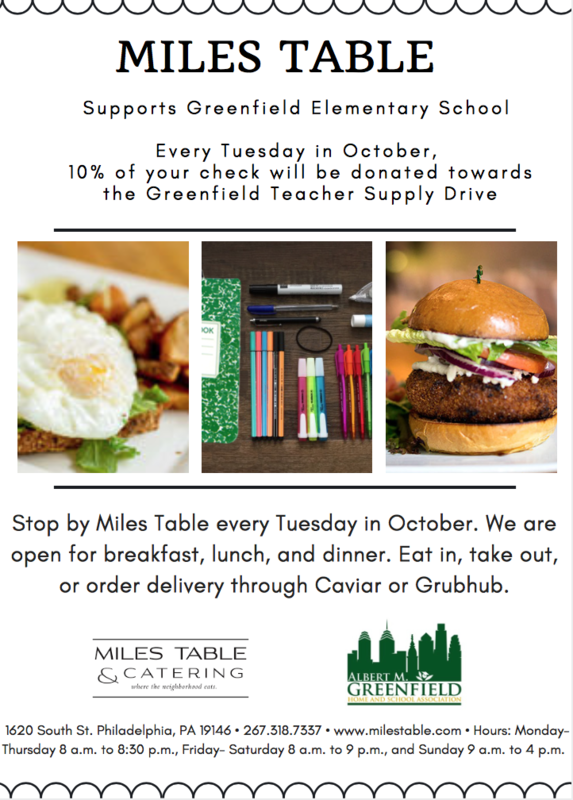 Stop in to Miles Table every Tuesday in October, and 10% of your check will be donated toward the Greenfield Teacher Supply Drive. Miles Table, located at 1620 South St., is open for breakfast, lunch, and dinner. Feel free to take advantage of this fundraiser by eating in, taking out, or ordering delivery through Caviar or Grubhub! Be sure to check them out on Facebook (www.Facebook.com/MilesTable/), Instagram (@milestable), or Twitter (@MilesTable)! 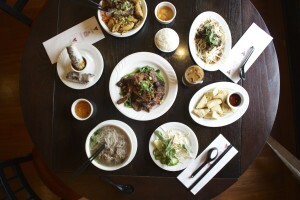 Vietnam Restaurant and Café announce a new lunch promotion. For only $15, guests can enjoy three courses of some of Vietnam’s tastiest and most popular dishes! The first course includes light starters like their Veggie Spring Rolls, Vietnamese Ravioli, Chicken Papaya Salad, and more. For the second course, guests can choose from options like the classic Spring Roll Vermicelli, Lemongrass Chicken, Chicken Pad Thai, and everything in between. And finally, a refreshing dessert course of either green tea or mint chip ice cream rounds out this amazing deal. Stop by the Vietnam Café in University City or Vietnam Restaurant in Chinatown to take advantage of this special, and be sure to visit their website for a closer look at their expansive menu! Vietnam Restaurant and Café can be found on Instagram and Facebook. Usually, nothing goes together better than a mouthwatering burger and fries. However, Misconduct Tavern is willing to try and change that. Misconduct is releasing new side options to pair with their huge selection of handcrafted burgers. Still in the mood for fries, but want a healthier option? Try their sweet potato fries! 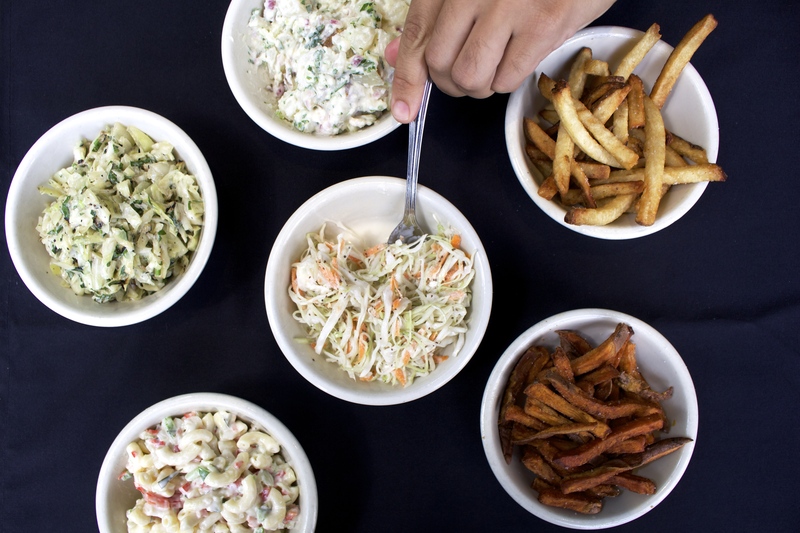 You also can’t go wrong with other options like: potato salad, green salad, classic or grilled slaw, caesar salad, and macaroni salad. Whatever you choose, it will be the perfect companion to one of Misconduct’s adventurous and delicious burgers. Stop by 1511 Locust St., or 1801 JFK Blvd. in Philadelphia, PA. Follow them on Facebook [/misconductphl], Instagram [@misconducttavern], and Twitter [@MisconductPHL]. 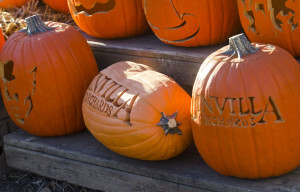 Pumpkinland Now Open at Linvilla Orchards! Pick your own perfect pumpkin at Linvilla Orchards this fall! With over 100 tons on display during Pumpkinland, Linvilla will have pumpkins of all shapes and sizes to choose from while enjoying live music and entertainment. There will also be pick-your-own apples available and fun fall activities going on including our apple slingshot and pumpkin ring toss! Also be sure to check out Linvilla Orchards on Facebook, Instagram, and Twitter!